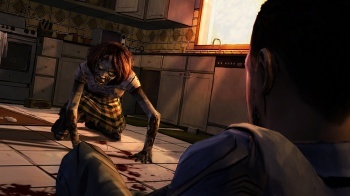 The Walking Dead's success could help Telltale make its own original property. Telltale Games' episodic zombie saga grossed about $40 million, or the equivalent of 8.5 million episodes sold, since its launch in April 2012. This runaway success, according to Telltale CEO Dan Connors, will help grow the company, and one of the areas of growth Connors is looking at is more original property. "That would be an area we'd be interested in pushing to grow more there," said Connors, when talking about Telltale's future plans. Or perhaps a partnership with LucasArts could be fun, or something to do with Half Life ... but this is all Connors' wishful thinking, at least for the moment. Telltale's focus is on the next Walking Dead series, which Connors confirms the studio is working on right now. But what can gamers hope for? Naturally Connors isn't in a hurry to say exactly what's in store, but don't throw away your old saves. "This all remains to be seen," says Connors, "but we are definitely figuring out how to carry the saves over." So your old choices could matter just as much in the second season as they did in the first. As for which platform you'll see it on, while Connors has great hopes for the iOS mobile space - claiming there's much revenue still to be had there - Connors prefers to concentrate on an all-platform strategy. "It increases the amount of people we're speaking to," says Connors.